So that all of our guests can enjoy their stay with us, we do not accept pets (of any size) and the chalet is non-smoking. 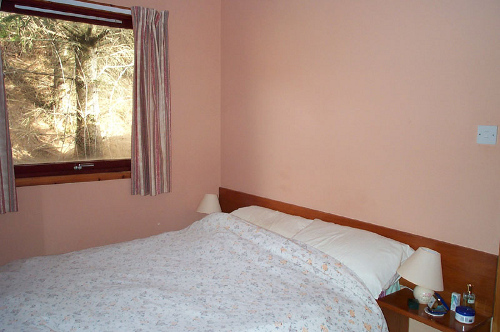 The Chalet is well appointed and contains almost everything you need for your stay apart from linen which may be hired for £15 p.w. If you bring your own linen, you will need pillowcases, duvet cover / sheets, towels and tea towels. Double-glazed throughout, there is heating in every room. 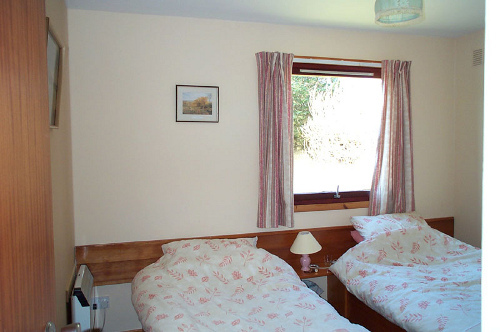 There is 1 double bed and 2 single beds and a sofa bed in the lounge for extra guests. 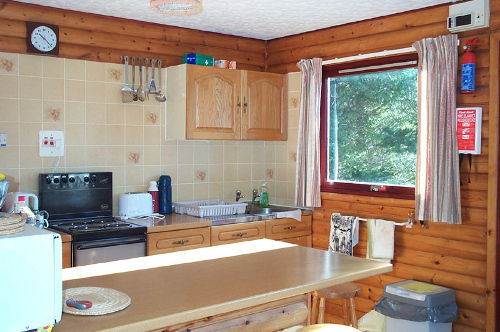 The kitchen is fully equipped including fridge, microwave, toaster, electric cooker, cafetiere, etc, plus a complete range of crockery and cooking utensils. Electricity is supplied via a meter which takes £1 coins. 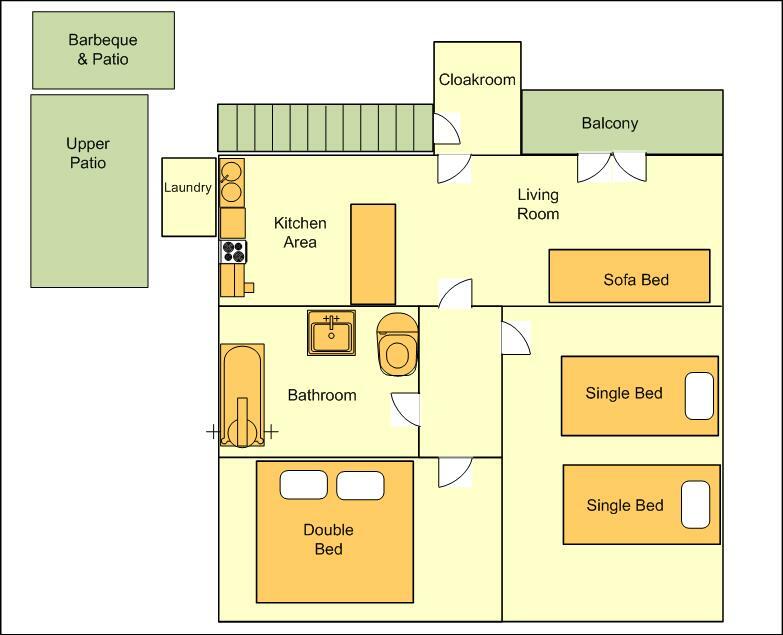 There is a laundry room which has washing, drying & ironing facilities and contains a small freezer. The bathroom is eqipped with bath, shower, toilet, handbasin and heated towel rail. The living room has a flat screen TV with set top box, a DVD player and a radio / CD / cassette player. 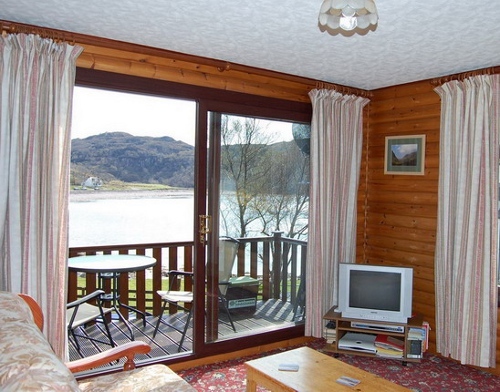 The outside balcony off the living room, has simply superb views out over the Bay. The Television reception this far North can be affected by atmospheric conditions - if the reception does go a bit squiffy, be patient and please don't fiddle with the set as the signal always comes back. There is a coinbox telephone for your convenience. There is a folder in the chalet containing maps, leaflets and brochures providing information on walking, fishing, deer stalking, caving, bird watching, archaeology, wildlife, sporting activities etc. etc.